In music, albums are often deemed ‘important’ by the music press – meaning they’re culturally significant, capturing the zeitgeist of the time they were released, whilst at the same time, driving forward toward something new. 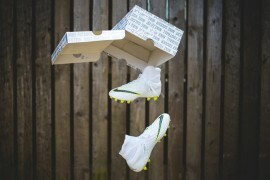 Whilst it seems almost ridiculous to say so, the same can be said of football boots. 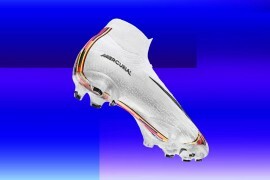 The defining boot of the 90’s was hands-down the adidas Predator, whilst the 2000’s saw the rise of the Mercurial Vapor. 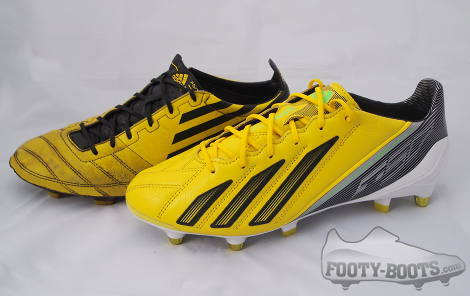 Right now, though, we would argue the boot which has had the most impact since 2010, would be the adidas F50 adiZero. 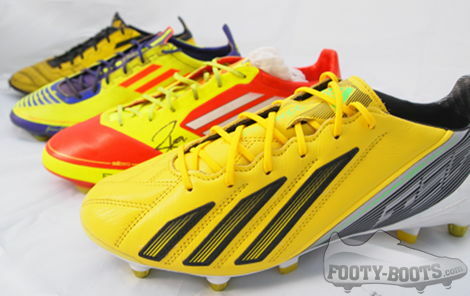 Launched in May 2010, the original adiZero smashed expectations with it’s lightweight construction and bold design. 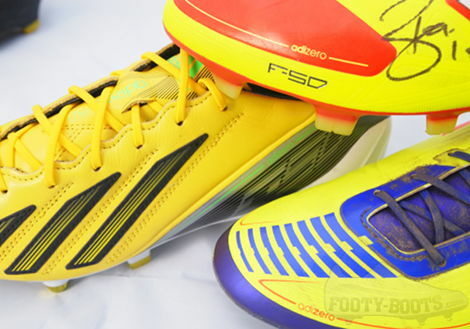 Weighing only 165g, the adiZero matched the limited edition Puma v1.815 Ferrari but wasn’t a limited edition (and didn’t cost £250, unlike the Puma) – making it the lightest production football boot, at the time. 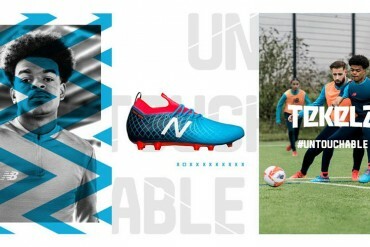 Whilst there were plenty of rumours abound, the adidas F50 adiZero was something of a surprise to many; despite Nike having blazed a trail in lightweight ‘speed’-focused football boots for the past decade, adidas had stuck by the TUNiT system as a vital part of the F50’s image for four years, and – due to the components required to make it work – never really pushed the F50 as an out-and-out speed boot. That all changed with the adiZero. 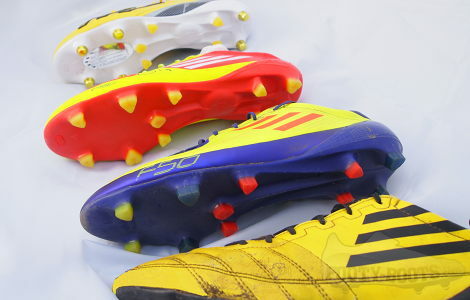 With TUNiT removed from the boot’s blueprint completely, the adiZero burst to life during the 2010 World Cup, responsible for more goals than any other boot. In the following 2010-11 season, player uptake was incredible as professionals ditched what they were wearing previously to step in to the F50. 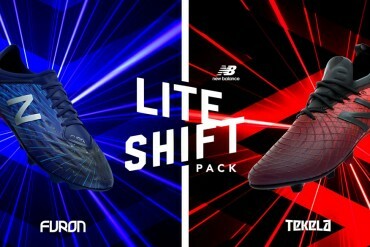 Throughout it’s three-year life, the adiZero has maintained the same standard weight point for it’s synthetic iteration (165g), with the exception of one; the 145g adidas F50 adiZero Prime. 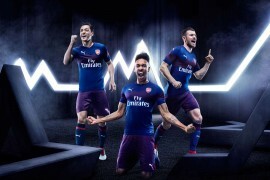 Rather than an out-and-out second generation, the Prime was a ‘stop-gap’ that allowed adidas to try out a number of new technologies that would have a lasting impact, despite the weight being bumped back up to something more solid. Internally, the adiZero Prime built on the internal TPU support bands of the original release. These integral parts of the shoe are designed to compensate for the boot’s lightweight construction to provide a comparable level of support to a heavier boot. Working with the lacing system and upper, these Techfit-inspired bands help lock the foot in place to improve acceleration and reduce ankle roll. On the outside of the Prime, adidas added an external support band, which not only strengthened the construction of the boot, reducing wear and tear, but allow the boot to cope with the pressure generated by the foot when moving side-to-side, improving lateral stability – something that would become the ‘SprintWeb’ on the latest two adiZeros. The key to the Prime’s incredible weight-point was in it’s adiTwin Lite upper. Whilst adidas haven’t revisited some of the more frivolous features of the Prime (we’re looking at you, kevlar laces), this revolutionary synthetic has been at the heart of the last two synthetic adiZeros. As impressive as the synthetic version is in terms of tech-specs, the leather F50 adiZero has never had any problem winning over players despite being 10g heavier than it’s plastic-y cousin. Looking at the very first leather adiZero and comparing it to the latest, it’s fair to say adidas have made the leather adiZero more than just an after-thought. 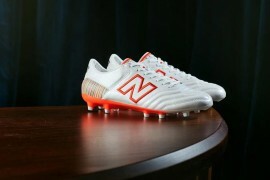 The same goleo leather is used on both models, but it is used far more generously – sweeping up the instep and outstep of the boot, rather than just ending at the toes. 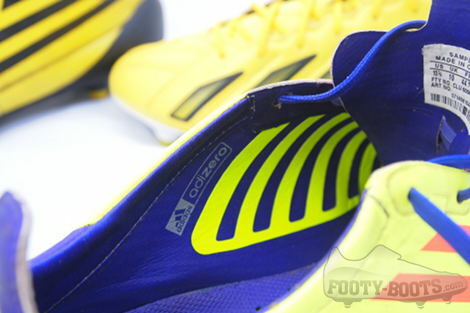 The internal workings and aesthetics of the adidas F50 adiZero have evolved massively over the last three years, but there’s one thing that adidas seem confident they got right first time – the soleplate. 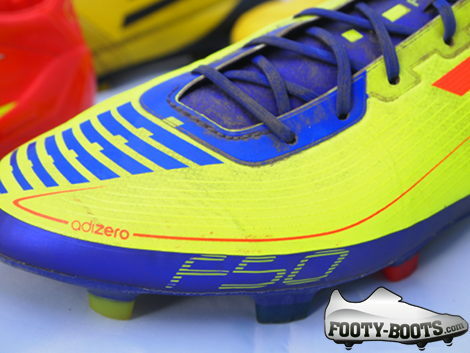 Since the adiZero‘s launch, the SprintFrame has been worked into all adidas boots with subtle tweaks to the design – however, on the F50 itself, it has barely changed at all! 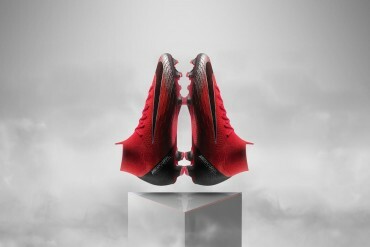 The sole exception, of course, being the addition of the miCoach cavity which was brought in on 2011’s model. 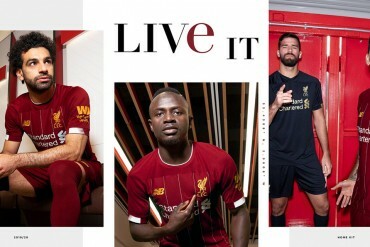 The only natural question now, is where do adidas go from here? Having stuck by the 165g weight point for three years, one would think that adidas feel this is the ‘right’ weight for their signature speed boot. 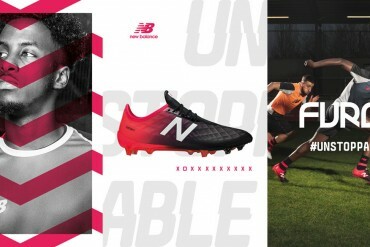 Then again, adidas have attested that the ‘F’ in ‘F50’ stands for ‘future’ – so we wouldn’t write off the innovators in Herzogenaurach pulling out something even more daring for Generation 4! Yeah, the soleplate didn’t change. That’s the problem. 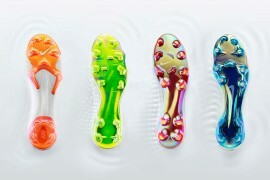 But it has been this kind of soleplate which caused lots of injuries. The structure (the triangle-shape look) is kinda goodlooking but is one of the main reasons for too much/wrong grip. 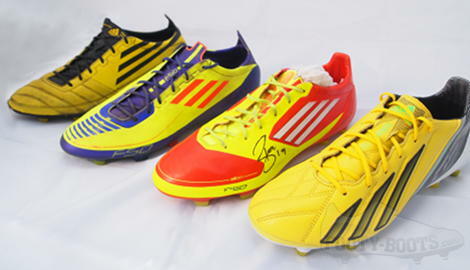 I made some researches about the occurrence of torn ligaments – and yeah, award-winning F50 was on first place. 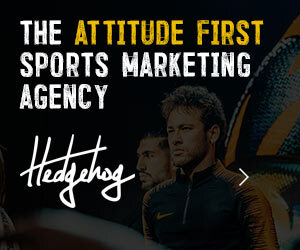 Thanks, but I will never buy any adidas football product at all. 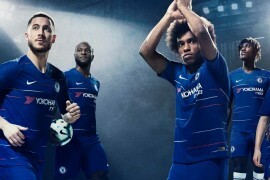 I think you must also take into consideration that the number of injuries that occur to players wearing the sprintframe soleplate is higher than others because of the sheer number of players wearing adidas boots; these injuries can happen in any boots. I think your first generation boot here is a fake. Old? Yes. Fake? Definitely not. Where did you get data from? You need a LOT of data to make a meaningful statistical conclusion. P.S. My grandma told me Vapor is a bad boot, I will never buy it again. The first three are the best. (Left to right.) I have the 2nd ones in blue and green,(Leather and soft ground.) I love them. 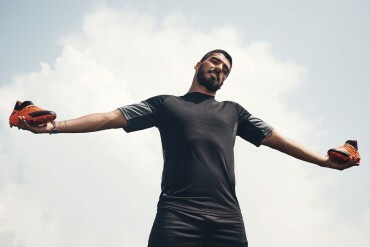 u moron chamcha of nike the f*ck!!!!!!! f off! I hope you know that Adidas has more coloways than Nike. 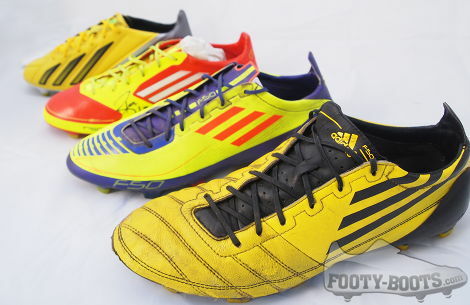 And many regard Adidas’s recent f50 colorways to be some of the worse ever.